25 Minute Queso Fundido bursting with juicy chorizo sausage and 3 cheeses is the cheese dip of your dreams! This spicy, gooey melty Queso Fundido Queso is truly one of my favorite dips ever. It should come with a warning: you will want to eat the entire thing! And so will all your guests. 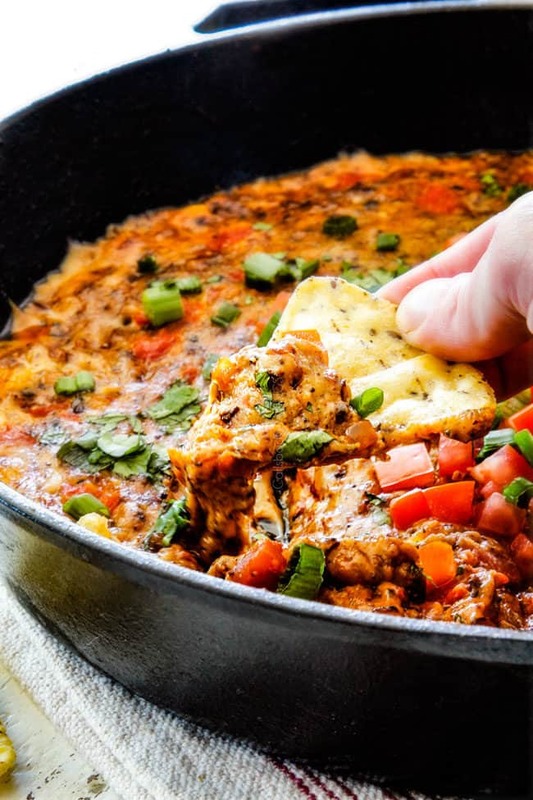 This warm, salty, gooey hot skillet dip is perfect for all your parties and can be prepped entirely ahead of time then baked when guests arrive! What is a queso fundido? Decadent cheese dips rule the appetizer table from my fabulous Brie Spinach Dip and Jalapeno Popper Dip to my Buffalo Chicken Dip French Bread and Cheesy Chili Dip so with Game Day and holiday parties galore, I thought it was time for another pure indulgent delight – cheesy, gooey, melty kickin’ Chorizo Queso Fundido! Queso Fundido is the more flavorful, dynamic, addicting cousin of queso or cheese fondue. It is an appetizer of hot melted cheese and spicy chorizo that is often served flambé at restaurants. This classic Mexican appetizer is less creamy and thicker than queso or fondue because it is mostly cheese with little or no added liquid. In other words, it is piping hot, gooey, stringy cheese just begging to be scooped up by a tortilla chip and shoveled into your mouth – again and again and again. My version of Queso Fundido contains no Velveeta just quality real cheeses melted together with chorizo, tomatoes, beans and green chiles. 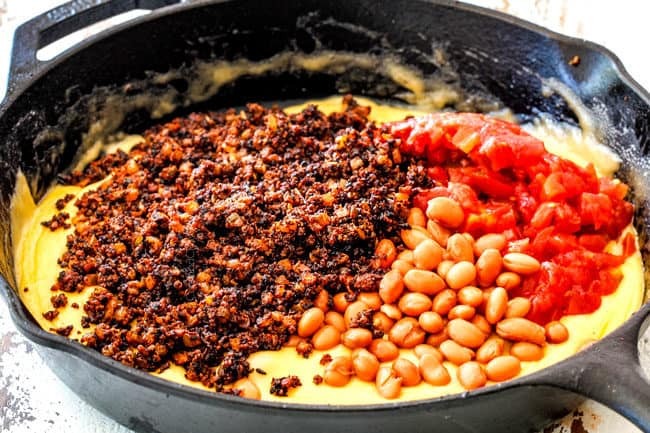 The cheeses make it gloriously cheesy and the chorizo, tomatoes and beans makes it more flavorful and textural pleasing than any other cheese dip. We are talking intoxicatingly delicious here. Patrick and I almost devoured the entire hot and bubbly Queso Fundido skillet in one sitting. We had to tear ourselves away from this paradisiacal cheese dip. Good luck trying to do the same. What does Queso Fundido Mean? The direct translation of queso fundido from Spanish to English is melted or molten cheese. It is also often referred to as queso flameado which is Spanish for “flamed cheese.” I just call it delicious. What kind of cheese is used for queso fundido? Authentic Mexican Queso Fundido is usually made with Oaxaca, Manchego, Chihuahua or Menonite. In the US, however, these cheeses can be hard to come by and usually not sold at your local grocery store. My Queso Fundido recipe is US friendly and uses a combination of Monterrey, and mozzarella cheese as well as sharp cheddar for flavor. While cheddar isn’t traditional in Queso fundido, it adds a pop of irresistible flavor. If you are able to locate Oaxaca, then you can substitute it for the Monterrey and mozzarella in the recipe. 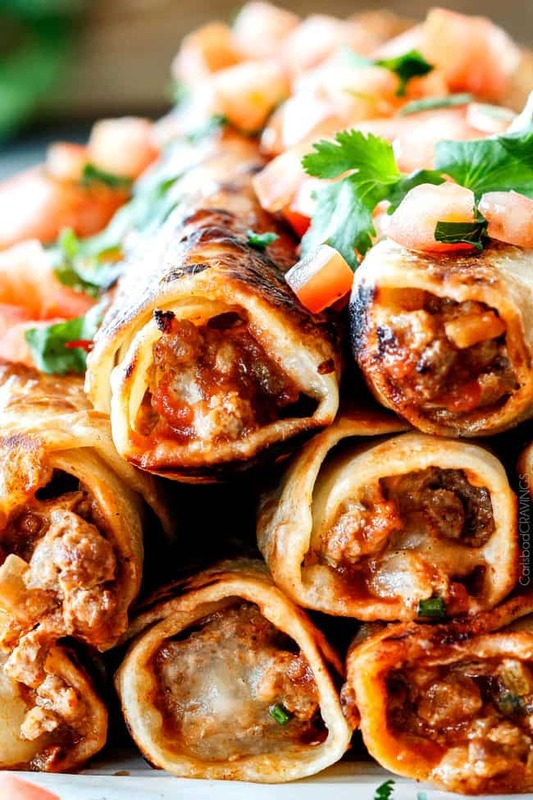 Oaxaca has the buttery, creamy taste of Monterey jack and the stretch of mozzarella cheese. If your grocery store carries it, it will be located with the specialty cheeses. If at first look, however, your grocery store doesn’t carry Oaxaca, then I personally wouldn’t spend effort hunting for it because this Queso Fundido is spectacular even without it. You can’t have the best Queso Fundido without chorizo, otherwise you might as well just make queso. The spicy chorizo is seeping with flavor, so much flavor, in fact, it is bright or dark red because of all the seasonings. Mexican chorizo is seasoned with chili pepper, paprika, cumin, oregano, cinnamon, cloves, and salt. 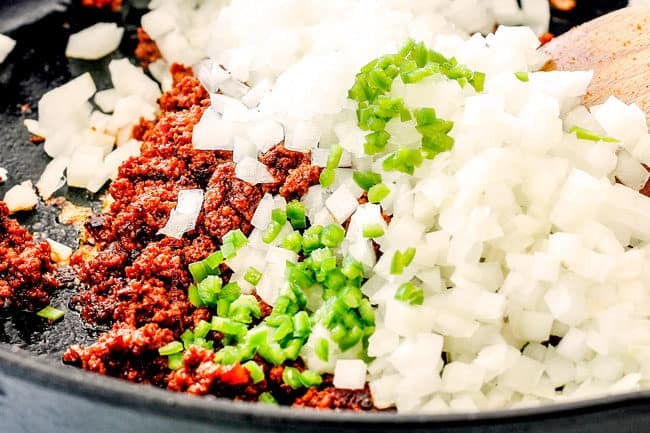 You know I love spices, but the Mexican chorizo packs so much punch I didn’t have to add any extra seasonings to my Queso Fundido recipe; so please don’t skip the chorizo – your taste buds and everyone else’s’ will thank you. If you aren’t familiar with where to buy chorizo, I’ve included more info in the ingredients section. What Ingredients are used in Queso Fundido? Mexican Chorizo. Mexican Chorizo is different than Spanish chorizo. While Spanish chorizo is dried and cured sausage, Mexican chorizo is a spicy ground meat sausage that is most commonly sold fresh and uncooked. You can find it with the other raw meats or sausages in the refrigerated section of your grocery store. Onion. We are going to use ½ diced yellow onion but if you want to be lazy (and I love being lazy), then you can substitute the fresh onion with 1 teaspoon onion powder. Garlic Cloves: We are going to use 2-3 garlic cloves or you can substitute with 1 teaspoon garlic powder. Cheese: As previously discussed, we are going to use Monterrey, mozzarella and sharp cheddar cheese. If you can get your hands on Oaxaca cheese (usually located with the specialty cheeses) then substitute it for the Monterrey and mozzarella. Chicken Broth: Take care to use low sodium chicken broth so your Queso Fundido isn’t too salty. Pinto Beans. I am obsessed with the pinto beans in this recipe – please don’t skip them! They add a wonderful textural creaminess that is pure palate pleasure. Rotel: Rotel is a can of tomatoes with green chilies in them. Many grocery stores also carry their own brand which will just say “tomatoes with green chilies.” If you can’t find them, then use a can of diced tomatoes with 2 tablespoons mild diced green chiles. How do you make Queso Fundido? Add cheese to a medium bowl and toss with flour. Set aside. Heat a large cast iron skillet to medium high heat. 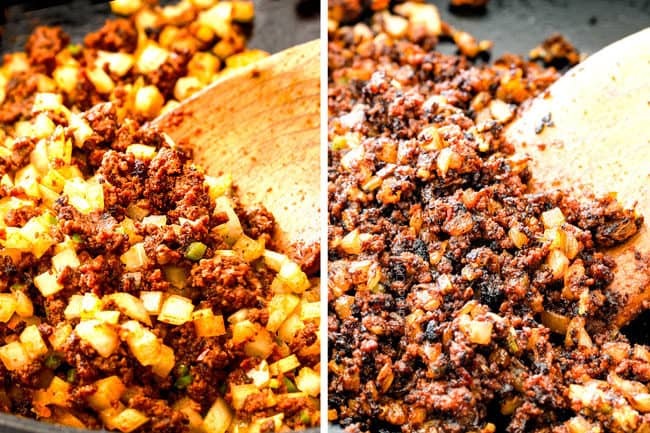 Add chorizo and cook and crumble for 5 minutes. Add onions and serrano peppers to skillet and cook. Cook until the chorizo is crisp and the onion is softened, 5-7 minutes. Add garlic and sauté 30 seconds. Drain off any excess fat and remove to a separate bowl (NOT the cheese bowl), do not wipe out skillet. Turn heat to the lowest setting and add chicken broth. 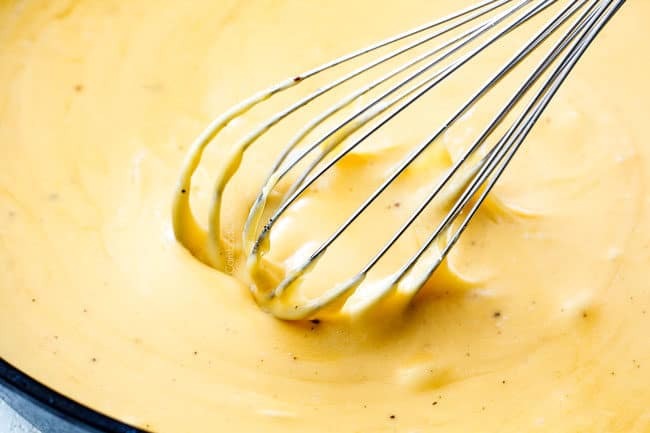 Whisking constantly, add the cheese mixture a little bit at a time until melted and smooth. Stir in the beans, tomatoes, and chorizo mixture. At this point you can bake immediately or cover the Queso Fundido and refrigerate to bake later. How Long Do you Cook Queso Fundido? Bake Queso Fundido at 400 degrees F for 5-7 minutes. You want the cheese to be hot and bubbly BUT not hardened on the top or it won’t be as creamy and can even have a chewy texture. I would stark peeking around 5 minutes or you can keep the oven light on to make sure you don’t overcook your Queso Fundido. 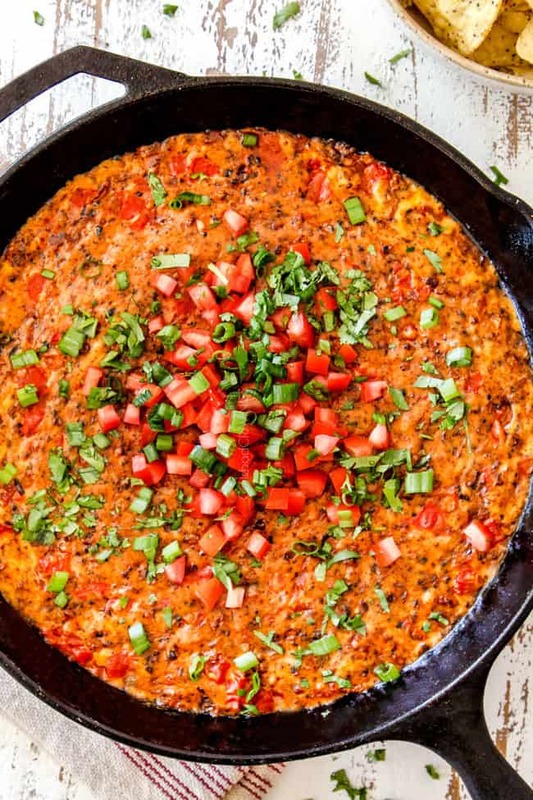 What type of Pan Should I cook Chorizo Queso Fundido In? I recommend a 10-inch cast iron skillet so you can easily transfer your skillet from the stove to the oven. 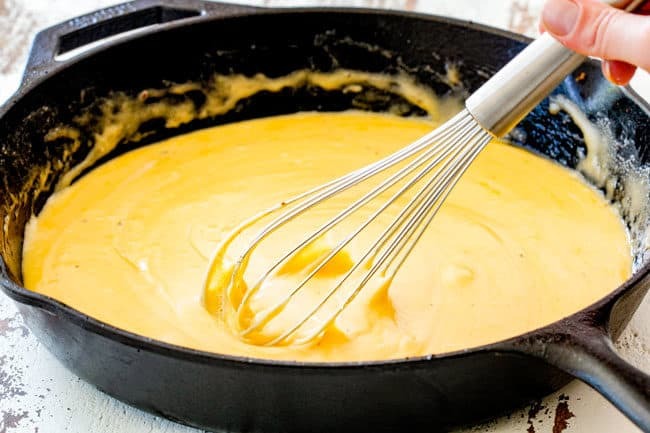 This smaller skillet is also optimal because it helps the cheese stay gooier for longer instead of firming up if it were spread out in a larger skillet. 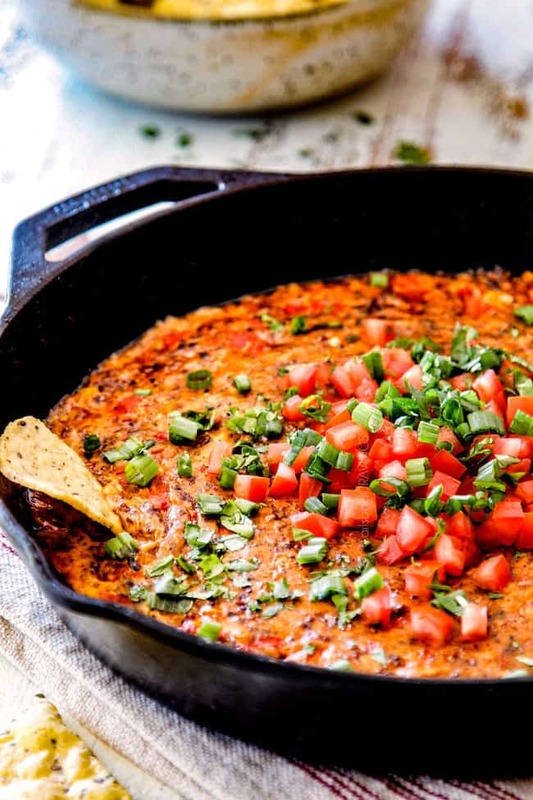 If you don’t have an oven safe skillet than you can cook your Queso Fundido in a skillet then transfer to a regular glass or ceramic baking dish to bake – just take care you watch and adjust baking time accordingly so the cheese doesn’t harden on top. What should I Serve with Queso Fundido? 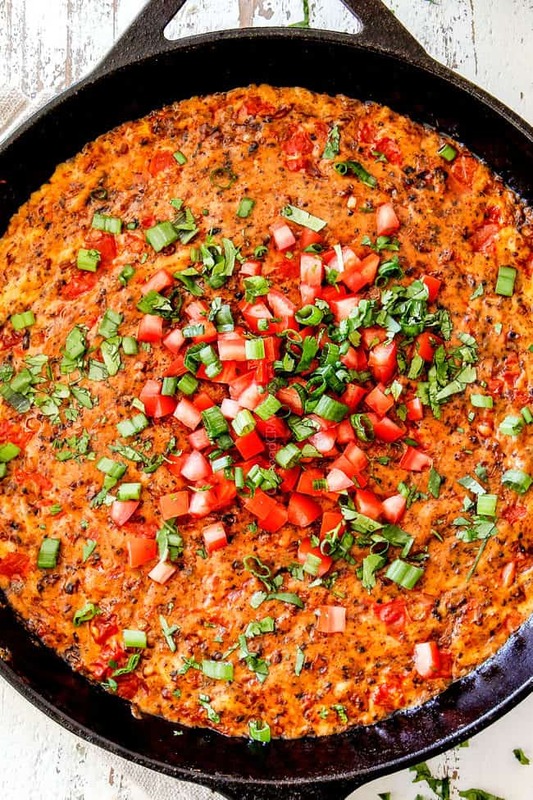 I like to top my Queso Fundido with chopped tomatoes, green onions and cilantro for a burst of fresh aromatic flavors against the rich dip. 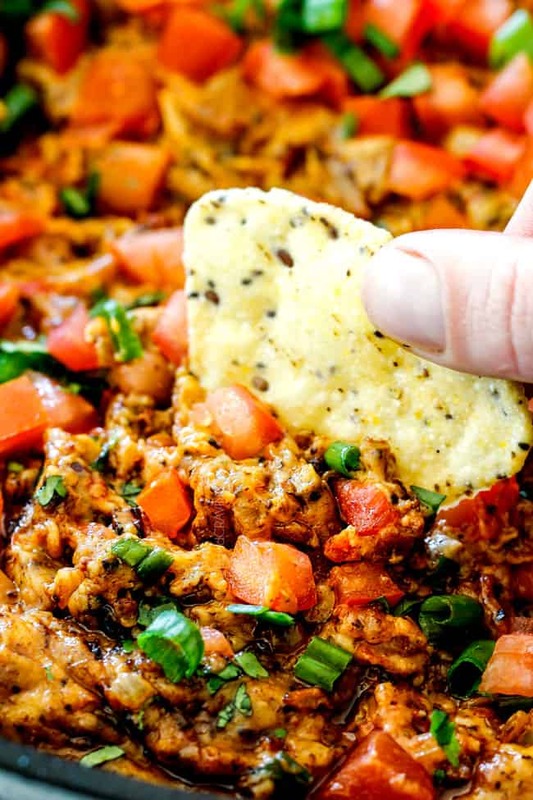 As far as dipping, my personal favorite to dip into Queso Fundido is classic tortilla chips although it can also be served with corn chips (Fritos) or warm tortillas. Can I make Queso Fundido ahead of time? You can prep the Chorizo Queso Fundido to the point of assembling then stop right before you are supposed to put it in the oven. Instead, cover the cheese dip with foil and refrigerate until ready to serve. When its go time, simply pop the dip in the oven. You will need to add an extra 5 minutes or so of baking time. Can I Make Queso Fundido in a Crock Pot? I would make the Queso Fundido according to directions and then you can keep it warm in the slow cooker until ready to serve. Customize? While the temptation might to customize this dip, I don’t recommend skipping the beans or tomatoes as they impart a favorable texture. You definitely don’t want to skip the chorizo or it won’t be nearly as flavorful and won’t be Queso Fundido! Don’t overbake. I can’t emphasize this enough, so I’m saying it again. We want melty, bubbly cheese so it stays gooey and not hard on top. Protect Guests. The skillet will be very hot even 10 minutes after its been pulled from the oven so be sure to wrap the handle in a cloth so none of your guests burn themselves. Prep Toppings. Have your tortilla chips out and all your toppings chopped so you can serve your Queso Fundido hot immediately out of the oven. Serve immediately. Serve this Queso Fundido piping hot from the oven for the best gooey/melty consistency otherwise it will start to cool and harden. If you aren’t sure when you’re eating or when your guests are arriving, then assemble the dip and wait to pop into the oven. How do you reheat queso fundido? Queso Fundido should not be made ahead of time and reheated for a party, it is far better baked once and served immediately. Reheating leftovers for personal use, however, is perfectly delicious for the non-critic. It will still boast tons of flavorful cheesy goodness but the texture will not be as creamy. I don’t mind and still couldn’t stop shoveling it into my mouth, but just wanted to give you a heads up so you’re not disappointed. To reheat Queso Fundido, you can microwave induvial servings with a splash of milk and then stir or warm the skillet over medium heat and stir until melted and bubbly, adding a little extra milk to creamily. Leftover Queso Fundido is also fabulous thinned out and mixed into rice or pasta with some sour cream – drool! 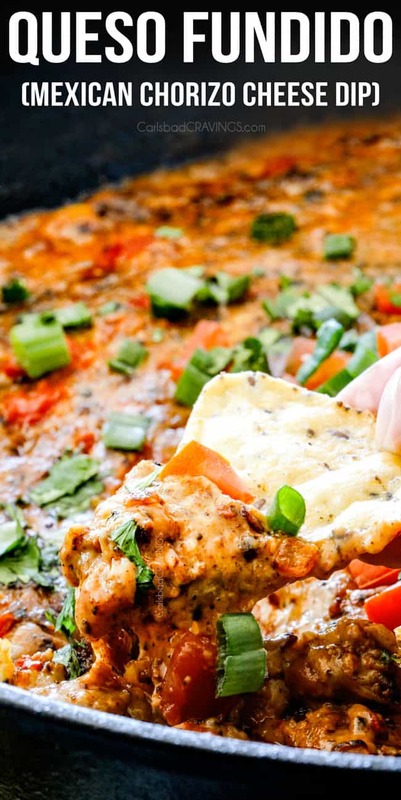 WANT TO TRY THIS QUESO FUNDIDO RECIPE? PIN IT TO YOUR APPETIZER, PARTY or MEXICAN BOARD TO SAVE FOR LATER! Looking for more Party Dip Recipes? 25 Minute Queso Fundido bursting with spicy chorizo sausage and 3 cheeses is the cheese dip of your dreams! This spicy, gooey melty Queso Fundido Queso is truly one of my favorite dips ever. It should come with a warning: you will want to eat the entire thing! And so will all your guests. 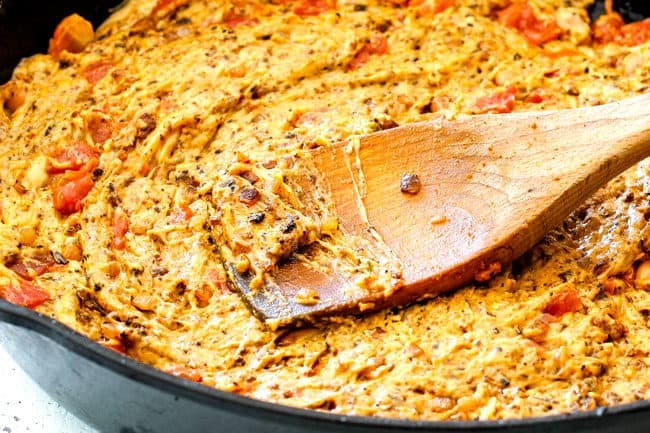 This warm, salty, gooey hot skillet dip is perfect for all your parties and can be prepped entirely ahead of time then baked when guests arrive! Heat a large cast iron skillet to medium high heat. Add chorizo and cook and crumble for 5 minutes. Add onions and serrano pepper and cook until the chorizo is crisp and the onion is softened, 5-7 minutes. Add garlic and sauté 30 seconds. Drain off any excess fat and remove to a bowl (NOT the cheese bowl), do not wipe out skillet. Turn heat to the lowest setting and add chicken broth. Whisking constantly, add the cheese mixture a little bit at a time until melted and smooth. Stir in the beans, tomatoes, and chorizo mixture. Bake at 400 degrees F until cheese is hot and bubbly BUT not hardened on the top, about 5-7 minutes. Garnish with tomatoes, green onions and cilantro. Serve immediately with tortilla chips. Mexican Chorizo. Mexican Chorizo is different than Spanish chorizo. 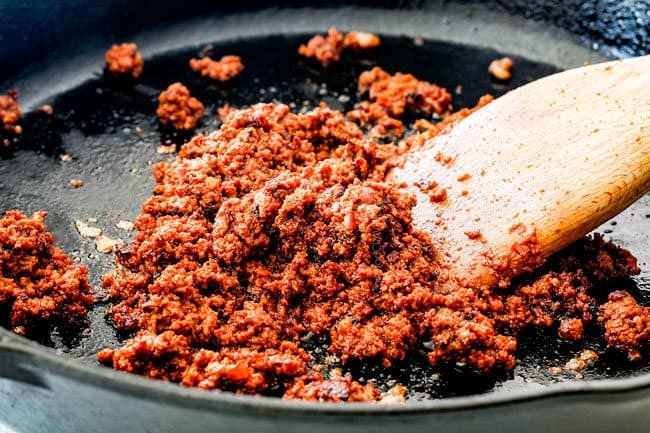 While Spanish chorizo is dried and cured sausage, Mexican chorizo is a spicy ground meat sausage that is most commonly sold fresh and uncooked. You can find it with the other raw meats or sausages in the refrigerated section of your grocery store. Don’t skip the chorizo because it bursting with tons of flavor and your dip won’t b nearly as flavorful without. Onion. If you want to be lazy (and I love being lazy), then you can substitute the fresh onion with 1 teaspoon onion powder. Garlic Cloves: You can substitute with 1 teaspoon garlic powder. Cheese: If you can get your hands on Oaxaca cheese (usually located with the specialty cheeses) then substitute it for the Monterrey and mozzarella. I recommend a 10-inch cast iron skillet so you can easily transfer your skillet from the stove to the oven. This smaller skillet is also optimal because it helps the cheese stay gooier for longer instead of firming up if it were spread out in a larger skillet. If you don’t have an oven safe skillet than you can cook your Queso Fundido in a skillet then transfer to a regular glass or ceramic baking dish to bake - just take care you watch and adjust baking time accordingly so the cheese doesn’t harden on top. Don’t overbake. We want melty, bubbly cheese so it stays gooey. If you overbake your cheese than it can harden on top, won’t be as creamy and can even have a chewy texture. Prep Ahead. You can prep the Chorizo Queso Fundido to the point of assembling then stop right before you are supposed to put it in the oven. Instead, cover the cheese dip with foil and refrigerate until ready to serve. When its go time, simply pop the dip in the oven. You will need to add an extra 5 minutes or so of baking time. OMG! No you didn’t Jen!! Yes this is the dip of my dreams.. And especially with your chorizo and 3 cheese version.. Yum yum yum! LOL! You are awesome Sahar, love your comment and I’m so pleased your loving my recipes! 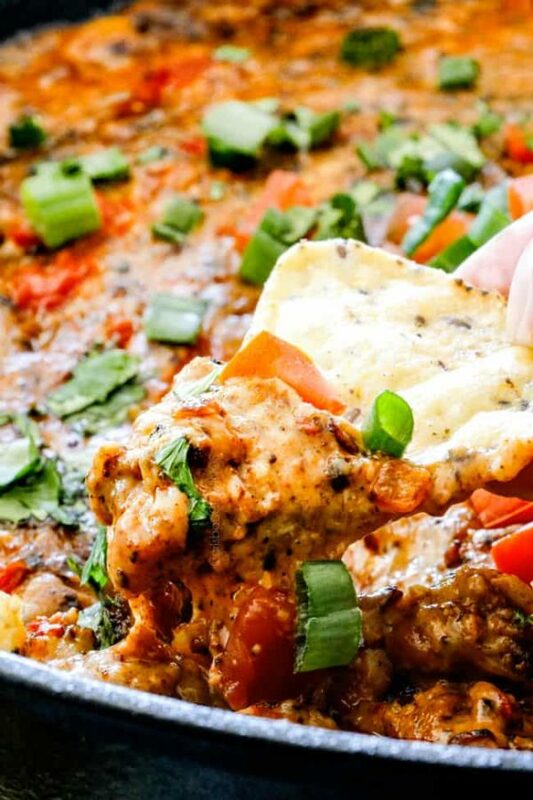 It sounds like you are equally excited about this Queso Fundido as we were to eat it – I can’t wait for you to try it! Made this for my birthday potluck yesterday – YUM YUM YUM!!!!!!!!!!!!!!!!! Happy Birthday Sandy! I’m so pleased you treated yourself to this Queso Fundido! I hope you have a fabulous birthday WEEK!